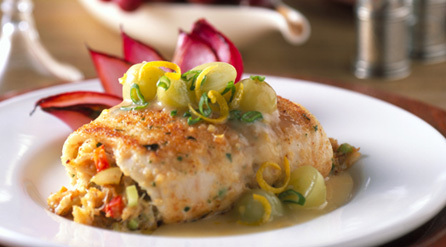 To prepare fillets: In medium bowl combine crab meat, celery, green onions, bell pepper, grapes, mayonnaise, \"Old Bay\" seasoning and 1/4 cup breadcrumbs. Stir until combined. Place sole fillets on cutting board. Divide stuffing between fillets and form stuffing into 1/2 inch thick patties in the center of each fillet. Fold fillet around stuffing, so that the ends of the fillet just meet. You should have a bundle that looks like a fish-wrapped crab cake. Dredge each bundle in remaining breadcrumbs and pat lightly to adhere crumbs. In non-stick frying pan heat butter and olive oil over medium-low heat. Place fillets in pan and cover. Cook about 3-4 minutes on each side, until golden brown and cooked through. To prepare sauce: In small saucepan combine chicken broth, lemon zest, lemon juice, grapes, salt and pepper. Bring to a boil over high heat and cook 2 minutes to reduce slightly. In small bowl combine flour and water and stir until smooth. Stir into sauce over heat and whisk until smooth and thickened. Turn off heat, add butter and whisk again until smooth. Spoon sauce over stuffed fillets.